Jules comes to Boulder Waldorf Kindergarten with a background in food and agriculture. After graduating with a B.S. in Culinary Nutrition from Johnson & Wales University in 2014, she felt called to journey to Boulder to learn more about the thriving local food movement in the area. 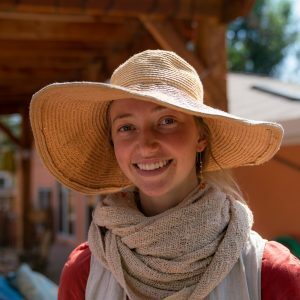 Bio-dynamic farming was her introduction to the work of Rudolph Steiner, and when the opportunity arose to substitute at BWK in the fall of 2017, she was eager to learn more about Steiner education. The daily and seasonal rhythms, sense of wonder, and goodness that permeate BWK complement and strengthen Jules’ work outside the school at a local goat dairy, and provide her with a grounded center from which she strives to approach each child and their unique journey into their truest selves. She feels deeply satisfied in helping facilitate learning through imaginative play, hands on work, and modeling practical activities. While not at BWK or cuddling goats, Jules can be found climbing a rock face, fishing and foraging in the mountains, or enjoying a quiet afternoon of reading, cooking, and sewing at home.